The African American Leadership Council asked the Congressional Black Caucus to oppose the Senate Gang of Eight’s immigration bill at a press conference Wednesday morning. The leaders called on the caucus to protect black workers by opposing the 844-page bill, portions of which the coalition described as amnesty. The bill released last week would place 11 to 12 million illegal immigrants on a path to citizenship. Speakers at the press conference cited the disparate impact of legalization on low-skilled workers, particularly black workers. They stressed the economic security issues involved in granting illegal immigrants a path to citizenship. The council questioned whether there are enough low-skill jobs for both African Americans and immigrants. One member said increased immigration levels would keep black unemployment, which is already nearly double the national average, elevated for some time. "With unemployment at 7.6 percent, this is preposterous," coalition member Charles Butler said. "What makes sense is for America’s jobs to be reserved for people who are legally entitled to compete for them." The coalition slammed establishment black leaders in the press conference, saying they do not represent the African-American community on this issue. They said they also feel betrayed by the NAACP and big labor, both of which have backed amnesty proposals. 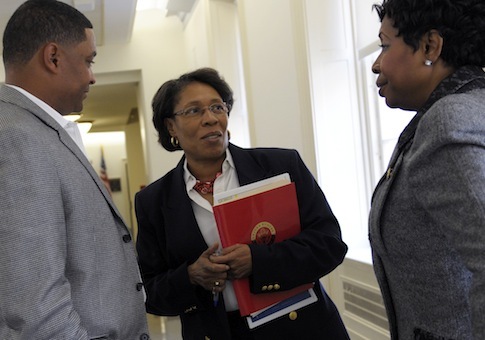 "Elite leadership is not the same as the black grassroots," said Frank Morris, former executive director of the Congressional Black Caucus Foundation. He said the immigration issue is often the most divisive between elite black leaders and regular members of the black community. The press conference comes on the heels of a letter sent earlier this month to Congressional Black Caucus Chairman Marcia Fudge (D., Ohio) by three members of the U.S. Commission on Civil Rights asking the caucus to consider the damaging effects of the bill on the black community. "Grant of legal status will likely disproportionately harm lower-skilled African-Americans by making it more difficult for them to obtain employment and depressing their wages when they do obtain employment," the members wrote. This entry was posted in Politics and tagged Illegal Immigration, Immigration Reform. Bookmark the permalink. Stephanie Merrick is managing editor of the Washington Free Beacon. She previously interned at the Daily Caller and the Washington Examiner. She graduated from the University of Michigan in 2012 where she served as Editor-in-Chief of the Michigan Review. Stephanie lives in Washington, D.C. Her Twitter handle is @stelisew. She can be reached at stephanie@freebeacon.com.